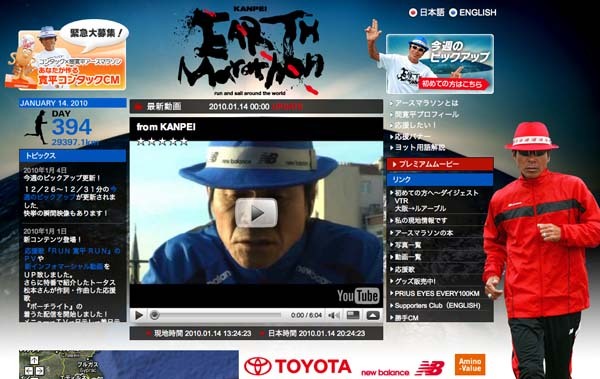 Now the people all over Japan are watching the fate of this project called Earth Marathon. It’s a courageous project that a famous Japanese comedian, Kanpei Hazama suspends show business, and runs and sails by yacht around the world. He started running from Osaka on December 17, 2008 and sailed across the Pacific Ocean from Chiba Prefecture to California. After that, he ran and sailed America, the Atlantic Ocean, Europe and Central Asia. He is now in Istanbul, Turkey. He’ll run through China and reach the goal in spring 2011. The running distance will be 20,000km and sailing distance will be 16,000km, so the total distance will be about 36,000km. Kanpei’s record videos are shown on Youtube, you can see his struggle in real time. So, I look forward to seeing how he is doing on the video everyday. On January 14, he stated that he has prostate cancer on his official blog. To this brave man who still keeps running while battling against cancer, over 2,000 messages were posted from Japan. Let me share some of the messages. When I see him challenging himself, my worries in life and work seem so tiny. One who is making a sincere effort is really beautiful. There are a lot of pictures of this Earth Marathon on flickr. Kanpei might run through your town. If you see him, cheer him up!